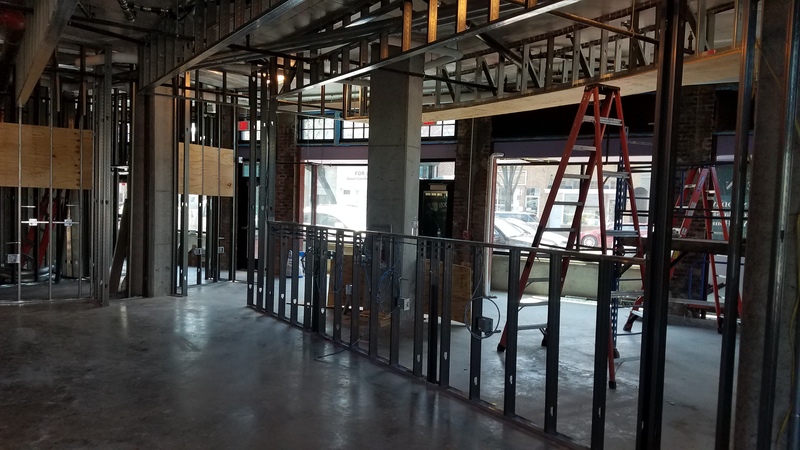 ANC6B. L-R Commissioner Jennnifer Samolyk; Commissioner Denise Krepp; Commissioner Kelly Waud; Commissioner Denise Krepp; Brian Ready, Parliamentarian; Jerry Sroufe, Secretary; Chander Jayaraman, Chair; Commissioner Steve Holtzman; Kasie Clark, Vice Chair; Corey Holman, Treasurer; Commissioner Kirsten Oldenburg. MPD 1st District Commander, Morgan Kane. Commander Kane takes questions from the audience at ANC6B last night. 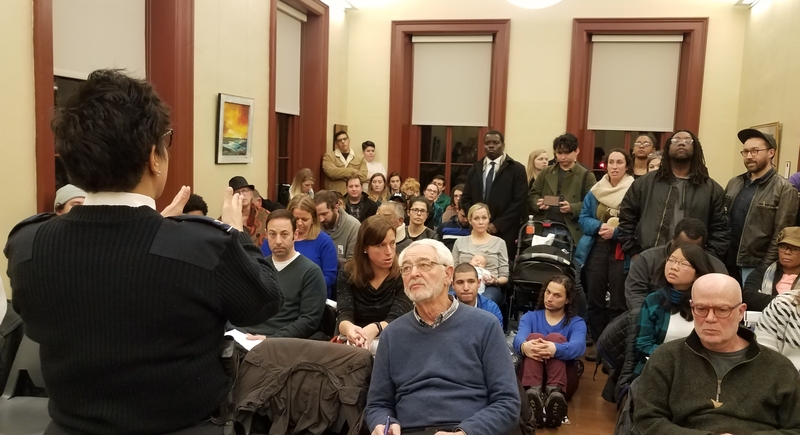 Last night ANC6B heard officers of the Metropolitan Police Department (MPD) respond to neighbors’ concerns regarding police interaction with three young boys (ages 10-12) last December in front of Frager’s Hardware on E Street, SE. 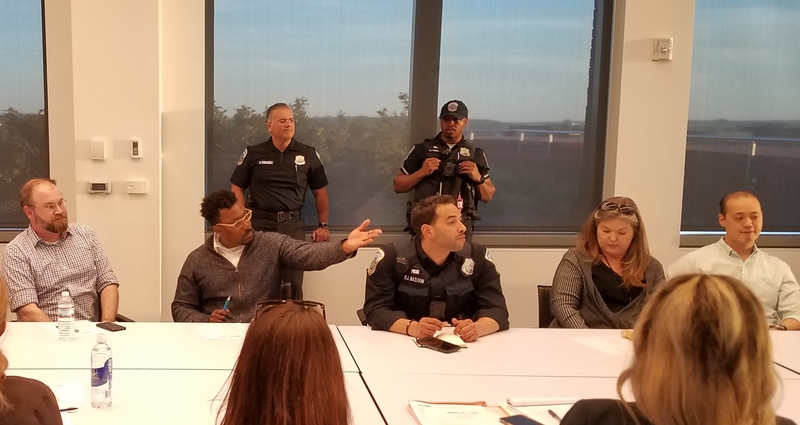 About two dozen concerned neighbors and activists from Black Lives Matter and The Stop Police Terror Project DC showed up to register complaints about police in a discussion that lasted ninety minutes. MPD 1st District Commander Kane related the police account to the ANC and assembled residents. According to her, officers responded to a 911 call from someone who claimed that an elderly gentleman had been threatened with a knife inside the CVS at 12th and E; the caller provided descriptions of three young boys who were alleged to be involved. She said two officers – a primary officer and a partner – responded to the report as a violent assault and possible robbery in progress. The officers located the elderly gentleman and interviewed him. Meanwhile, a bike unit comprised of a Sergeant and four officers, having heard the radio call and description of those allegedly involved, responded and encountered three young boys matching the description eastbound on E Street. Kane said the bike unit engaged the kids informally, questioning them regarding a possible crime, and “developing a rapport.” She said the officers told the kids they were not in trouble. Meanwhile, the two officers who were talking to the elderly gentleman determined that he said he had been followed into the CVS, had “perceived” a knife, and was scared. Kane added that “maybe the boys had been playing in a construction site” nearby. Officers determined that there was no robbery and no assault. The elderly gentleman wanted to go home and not pursue the matter. The primary officer and her partner then met the bike unit and the boys in front of Frager’s, and asked the bike team Sergeant if the kids had a knife and if he had patted them down. The tone the primary officer took with the boys was “strong,” Kane said, offering her view that it reflected the fact that the officer had lost a son to gun violence and her concern that the boys not end up the same way. No knife was found after the pat down. Kane said: “They should’ve been patted down from the beginning, but the police were trying to make the children feel comfortable.” The officers huddled, Kane said, to figure out how to proceed, and within 8 minutes of encountering the boys, decided parents had to be called. The following points were made by members of the audience in response to Kane’s narrative. Black people are being over-policed in this community, often subject to attention from police while carrying out innocuous or ordinary activities. The total length of time of the encounter was 39 minutes – kids were detained after no weapon was found and no crime had been committed – an inordinate amount of time that amounted to a form of detention. Why can’t they see the video from the officer’s body cameras? One of the officers mocked a resident who was videotaping the incident. With regard to the release of body camera footage, MPD’s FOIA official, Inspector Parker, cited the expensive redactions to protect identities of children and uninvolved parties passing by, and well as confidential radio communications picked up by the body cams as well as restrictions which protect juveniles. 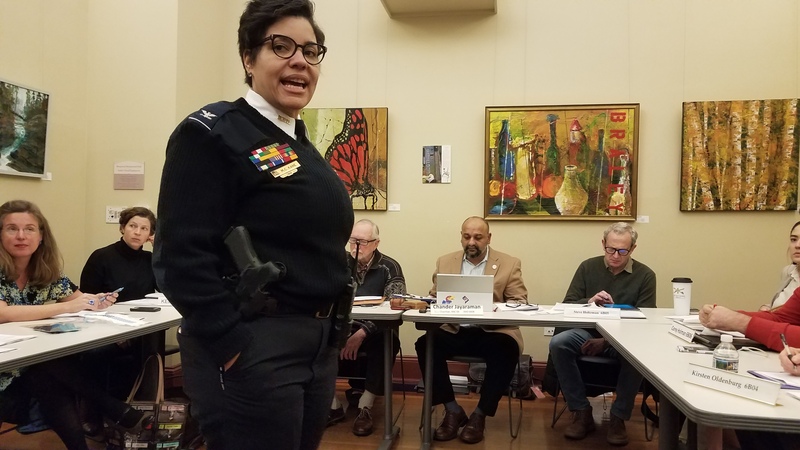 She said body cam videos are routinely viewed by those directly involved or their attorneys, but whether a video can be released to the public is ultimately in the hands of the MPD police chief. Kane said the officer alleged to be mocking the resident videotaping was actually laughing and joking with her, encouraging her to come closer to take the video. 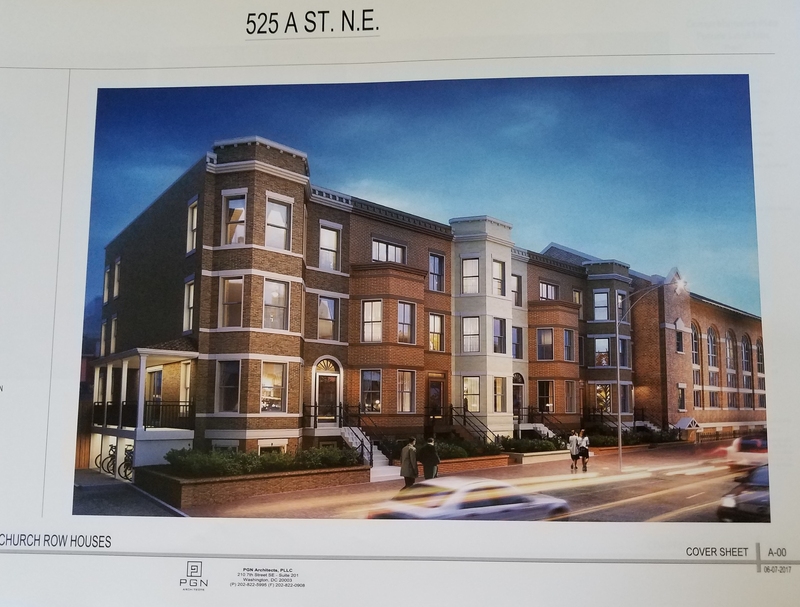 ANC6B Chair Chander Jayraman announced that he had been in communication with CM Charles Allen, who asked for time to review the video and have a conversation with MPD. Allen can’t release the video, but he can provide comment and talk publicly about it. Commissioner Denise Krepp suggested the conversation could continue at the Hill East Task Forcemeeting at 7:00pm at St. Coletta’s on January 28. In other business, ANC6B elected the following officers: Chander Jayraman, Chair; Kasie Clark, Vice Chair; Corey Holman, Treasurer; Jerry Sroufe, Secretary; and Brian Ready, Parliamentarian. Did I miss anything, or can we move on now? From what can be garnered from Janezich’s write-up, it sounds like MPD responded to a 911 call, a possible menacing, spent some time figuring it all out, determined that apparently nothing had happened, and life went on. A good resolution for all concerned. Thank you MPD.